Thelma J. 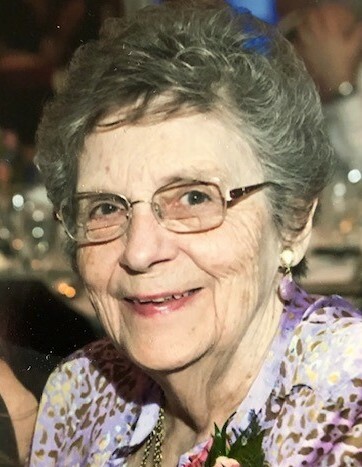 “Chicki” Westrom, age 88, longtime resident of West Chicago, passed away Thursday, January 24, 2019 surrounded by her family, following a long illness. Chicki was born on October 29, 1930 in St. Charles, IL the daughter of the late Edwin Dean and Thelma Robertson. Chicki was involved in the family businesses as owner-operator along with her husband Robert G. Westrom. Businesses included The Shoe Tree from 1954-1967, Microchem Mosquito and Pest Control from 1967-1986 and Microdata-Microfilm Service Bureau from 1974 until her retirement in 2005. Chicki was involved in the Mother’s Club, the early West Chicago Fire Department Women’s Auxiliary. Robert and Chicki worked in projects for the Jaycees in the 50’s and 60’s. Chicki was preceded in death by her husband of 64 years, Robert in 2012, her mother and father, E. Dean and Thelma Robertson. She is survived by her loving children, Dean (Deborah) Westrom of West Chicago, Brad (Janice) Westrom of Batavia, Lee Westrom and Mari Uribarri of Warrenville, Jan (Doug) Chase of Aurora; nine grandchildren, Kyle (Jenifer) Westrom, Jill (Nathan) Jeppesen, Robin Westrom-Tardy, Abby (Michael) Baldwin, Kelly (Andrew) Dohan, Matthew and Dustin Westrom, Jason Reardon and Nicholas (Kilye Clark) Reardon; thirteen great-grandchildren, Dalon and Claire Jeppesen, Maryn and Camryn Tardy, Collin, John and Ryan Westrom, Alarick Richey, Maeve, Madison, Michael and Maya Baldwin and Nora Dohan; two nephews, James and Jerry Westrom. She was also preceded in death by her brother and sister-in-law, Arvilla and John Westrom, mother and father in laws, Fred and Grace Westrom; one niece Joanne (Ralph) Detente. Visitation will be held on Sunday, January 27, 2019 from 11 a.m. to 3 p.m. at Norris-Segert Funeral Home & Cremation Services, 132 Fremont St., West Chicago (One block north of Washington St. & Main St). Funeral services will be held immediately following the visitation at 3 p.m. Sunday, January 27, 2019 at the funeral home, with Reverend Patrick Skinner officiating. Interment will follow at Glen Oak Cemetery in West Chicago. In lieu of flowers contributions in Chicki’s memory can be made to the American Legion Post 300, 123 Main St., West Chicago, IL 60185.